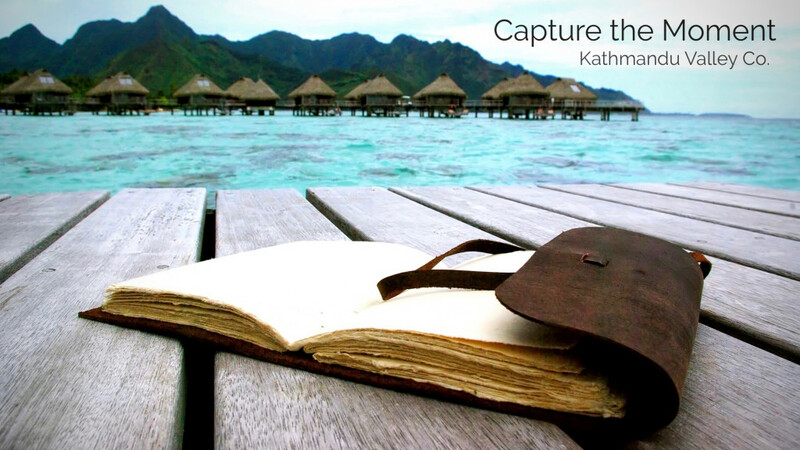 Whether it’s backpacking in the himalayas or enjoying the serene beauty of the pacific islands, the Everest Explorer Rustic Leather journal makes a great companion. Pictures may be worth a thousand words, but a handful of words can change a perspective, open a mind, and capture a memory that can inspire others for years to come. Our world has become saturated with pictures (pun intended), which makes capturing a moment on paper all that more precious. A picture can capture a smile, the words no matter how simple can capture the reason behind the smile. Capture the moment, and the journey with something special. We’re biased, but lokta paper that is handmade in the high himalayan mountains of Nepal is pretty special. The paper is made from cuts taken from the lokta bush. The fibrous inner back is cooked into a mash and then spread by hand across boxed screens and dried in the Himalayan sun creating one of the toughest papers out there resistant to tearing and damage from insects and mold. The finished sheets are carried down the mountain by donkey using traditional routes down the tricky paths. The leather in the Everest Journal is tanned using the time honored vegetable dye process of walnut husks making each journal unique just like each adventure is unique and has its own character. The Everest Explorer Journal comes in four sizes for adventures big and small. Take yours with you on your adventures, big and small, rustic or exotic.